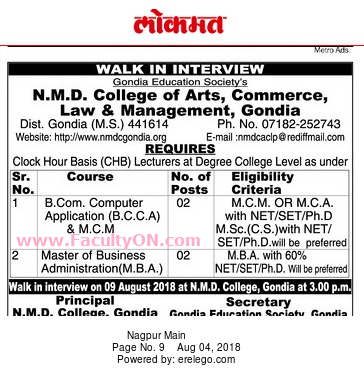 N.M.D College of Arts Commerce Law & Management, Gondia has advertised in the LOKMAT newspaper for the recruitment of Lecturers jobs vacancies. Interested and eligible job aspirants are requested to walk-in on 09th August 2018. Check out further more details below. About College: Natwarlal Maniklal Dalal College, the pioneering educational institution of Gondia Education Society is committed to carry forward the legacy bestowed upon us by the great visionary late Shri Manoharbhai Patel. It visualizes to impart quality education to the poorest of the poor. B.Com Computer Applications (BCCA) & MCM: M.C.M or MCA with NET / SET / Ph.D, M.Sc (C.S) with NET / SET / Ph.D will be preferred. Master of Business Administration (MBA): MBA with 60% of marks. NET / SET / Ph.D will be preferred. How to Apply: Interested and eligible candidates are requested to attend the Walk-in interview with updated CV along with originals & copies of certificates of education qualification / experience, copy of PAN card, copy of Aadhaar card and recent PP size photos to the following walk-in address.